People can’t absorb information effortlessly, it takes hard work and application. It is said. But drama allows you to “effortlessly” walk through a learning dialectic as you look through the eyes of characters in a conflict. Drama can be visual, but more importantly it’s emotional. Danish educational theorist Knud Illeris says genuine learning involves a subjective connection between the learner’s interests and motivations and the learning content, which always includes a cognitive, emotional, and social dimension. This makes perfect sense if we are teaching soft skills such as diversity and inclusivity. Being led through a scenario and allowed to view the world through other people’s eyes is clearly a perfect means of fostering empathy and understanding. But what about less emotional subjects? Is it worth making a learning drama about compliance issues or accountancy? If you can have more than one opinion about an issue it can be dramatized. If you can have an argument about the pros and cons of an issue this can be crystallised into clear stages of a dialectic and this in turn transformed into the actions of characters who bring it to life. Watching this drama, we naturally consider the wider implications of the actions. What does it mean to break a petty rule? We identify with the rule breaker, but do we really want to be them? Is the righteous character boring or simply trying to make it better for the rest of us? Such questions are not explicit, but implicit in the actions of the scenario. The beauty of this is that the viewer makes their own meaning. We reflect on it while we’re on coffee break. It resonates, and sparks conversations with colleagues. It weaves its way smoothly into our long-term memory. Watching a learning drama won’t make you into an expert, but it can make you feel like one, because when we watch other people in conflict we naturally have an opinion about it. Drama delivers a subjective connection between the learner’s interests and motivations and the learning content, including a cognitive, emotional, and social dimension. And once you have established that connection you can use cheaper media – perhaps cheaper-to-produce types of video – to deliver the more detailed learning. This is the power of drama. It’s effortless to consume but takes some serious expertise to put together. 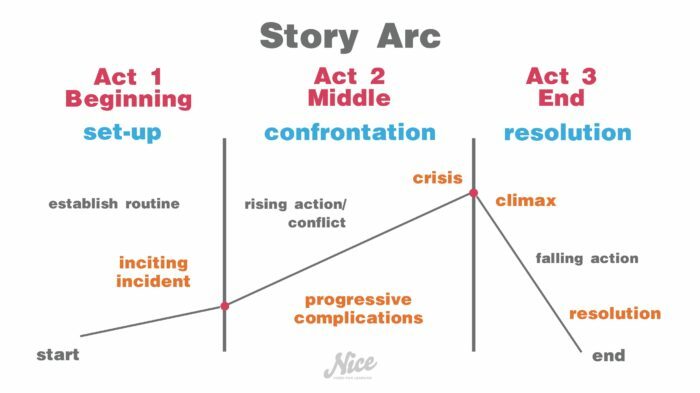 As part of my drive to share the tools of my trade with learning designers in this blog I’ll lay out the principles of the main story paradigm described by Aristotle and used in Hollywood. What’s important to know about this structure is that it’s evolved over centuries to model a journey of personal growth. As such it’s unlikely to be bettered. Here’s the paradigm with its 3 acts – 3 parts that we can call beginning, middle and end. This is the most basic idea of what a story is. The three acts are more technically termed the set-up, the confrontation and the resolution. The main elements of the structure we need to familiarise ourselves with are the Inciting Incident, Progressive Complications, Crisis, Climax and Resolution. Let’s talk about the Set-up. All stories need a set-up. We need to introduce the Protagonist, state the dramatic premise (what the story is about) and reveal the dramatic situation. We introduce our fictional world, the characters, the elements within it and what’s at stake. This part of the story is the hardest to tell in an engaging way. The audience need to understand the set up so they can understand character motivations and what’s at stake in the story. To do this you have to impart a lot of contextual information and simply sharing information is not dramatic. Every story needs exposition, but to make it part of the story it must be dramatized. I’ve written about this elsewhere, but the essential idea is to turn exposition into ammunition. Information about the fictional world means something to people within that world. We need to see them using it to get what they want. Information becomes active! In eLearning you have an advantage over pure filmmakers because you can impart a lot of the world of your characters in the eLearn before the video begins, rather as George Lucas did in the well known “A long time ago in a galaxy far, far away…”. You can potentially lay out all the story parameters including some of the previous events that affect the character’s motivations before the video starts. Once we’ve established all the elements of our story and have some idea of the normal way of things in this world, there will be an Inciting Incident. In Jaws the Inciting Incident is “shark eats girl, her remains are washed up and the Sheriff has a problem”. In Toy Story the Inciting Incident is the arrival of the new toy Buzz Lightyear threatening to displace Woody as Andy’s favourite. The Inciting Incident is the event that disturbs the established normality and kicks off the story. The Protagonist then reacts to the disturbance and tries to put things right with the minimum effort, but their actions only make things worse. Act 2 consists largely of Progressive Complications. Progressive Complications is the second of the 5 must-have elements of structure. It describes the main part of the story from Inciting Incident to the Crisis and Climax. To complicate means to make life difficult for characters. To complicate progressively means to generate more and more conflict as they face ever greater forces of antagonism, creating a succession of events that pass points of no return. A hole has opened up in reality and the Protagonist’s efforts to put the world back to how it was only lead to things getting worse and the problem escalating. This is played out in a series of scenes in which the Protagonist has to make ever more difficult choices. Now, a choice between good and bad, is no choice at all. Watching a drama in which someone has to choose between a good deal and a bad deal is not interesting because we know what they’d choose, and if they don’t it’s contrived. The sort of choices we need are choices between two things neither of which is ideal. Character forming choices. The best of such problems is a dilemma – a binary choice between two undesirable courses of action. Sophie’s Choice is a film named after the dilemma at its heart – in which Sophie must choose between her two children. It’s these, difficult, almost impossible choices that draw us into the mind of a character and get us emotionally involved. It’s when we are under pressure, when our lives get out of control that we have to look inside ourselves and overcome our flaws. We must learn to grow, and stories are about personal growth. It’s rare that we get a choice as dramatic as Sophie’s in our learning drama, but we can and we should strive to make things personal and emotional. Drama is about emotion, and that’s what makes it engaging. At this point, let’s ask, what is the Protagonist is fighting against? The Antagonistic forces are represented by an Antagonist. An Antagonist is ideally characterised as wanting the same thing as the Protagonist, but being bitterly opposed to them. So, in its simplest, and indeed highest form, good and evil are represented by two characters: James Bond and Ernst Blofeld, Darth Vadar versus Luke Skywalker, Harry Potter versus Voldemort, etc. Antagonists and antagonistic forces are something that corporate organisations often feel nervous about depicting, but if you want to show the positive it can only shine when put it in relief against something negative. How we craft such things to avoid unsettling corporate clients is another story. Act 3 is short like act 1. In act 1 we set up the problem, in act 3 we resolve it. In stories based on a literal journey, act 3 starts with The Return. The Protagonist moves back to the place they started from, but with a new perspective. The Protagonist has done all the introspecting they need to be effective, they now come face to face with the Antagonist. Crisis is the 3rd of the essential elements of the form. At every step of the way the Protagonist has had to make difficult choices but now comes the ultimate decision. This moment of dangerous opportunity is the point of greatest tension in the story. We all know that how the story ends will be revealed by this action. Confronted by an ultimate dilemma and face to face with the most powerful antagonistic forces, the Protagonist must choose one action or another in a last attempt to gain the object of desire. The Climax or the Climactic Action is the 4th essential element of story. It’s how the Protagonist responds to the problem of the Crisis, which is also the problem of the story. How they succeed or fail here gives us the deepest insight into their character. And this is also where the moral or the meaning of the story is communicated. In tying up your story you are making a kind of proof. If you encounter this problem and respond to it in this way you will get this result. The cop in a corrupt system resists temptation and is vindicated: moral – good triumphs over evil. Resolution is the fifth and final essential element of the form. Here we show the resonating force of the climax – how it has changed the world for others. It can also provide a “slow curtain” as in the end credits of School of Rock in which the band rehearse with Jack Black as the credits roll. Drama is a centuries-old set of techniques to model and communicate human emotion. If you don’t want to deal with emotions in your learning don’t use drama. If you do want to, embrace the idea of emotional communication and familiarise yourself with the basic techniques to represent them. For further reading I suggest Story by Robert McKee. Nice Media are just a delight to work with, the team seamlessly sought on site locations, meticulous attention to detail to ‘dress’ the site and actors, managed complex logistics and most importantly ran the project within the timeframe and budget.